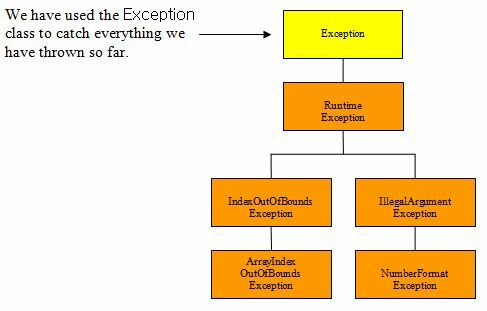 Now we know what the Java exception hierarchy looks like and the classes involved its time to start handling exceptions which may occur within our code. 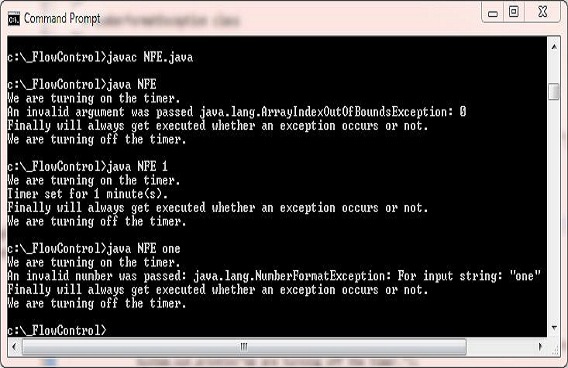 Exception control in Java is achieved using the try, catch, finally, throw and throws keywords. The throw keyword allows us to throw exceptions and we can declare exceptions from within our methods using the throws keyword. Both these keywords are discussed in much greater detail in the next lesson Declaring Exceptions. In this lesson we focus on the try, catch and finally keywords and how we use them to handle exceptions in our code. The try keyword is used with a code block to put the code that may cause an exception in. The catch keyword is used with a code block to put the code to handle an exception in. The finally keyword is used with a code block to put the code that must be run whether there is an exception or not. The following table shows the different forms of the try catch finally construct. Execute statements in try code block. Execute statements in catch code block. Execute statements in finally code block. Execute statements in catch code block 1. Execute statements in catch code block 2. Execute statements in catch code block N.
When using a try block it must be accompanied by a catch block, a finally block or both. When using a catch block it must immediately follow the try block. When using multiple catch blocks they must go in order from the most specific error to the most generic as discussed later in the lesson in Exceptions And Polymorphism. When using a finally block it must immediately follow the last catch block, or the try block when no catch block is present. click the Folder option and call the folder _FlowControl and press enter. The try catch construct is the most commonly used of the three forms of the try catch finally construct listed in the table above. To get us started we will write a class that will cause a runtime error by trying to divide by zero. Save, compile and run the DivideByZero class in directory c:\_FlowControl in the usual way. The above screenshot shows the output of running our DivideByZero class. We got an ArithmeticException exception when we tried to divide by zero as expected. This is not a very elegant termination of our program and will mean nothing to a general user of the software. It also means termination of the program so any code won't get executed. We will rework the code using a try catch to output a message instead. The above screenshot shows the output of running our reworked DivideByZero class. This time we catch the ArithmeticException exception and continue on with our code. Save, compile and run the NFE class in directory c:\_FlowControl passing 1, then run again passing one. Save, compile and rerun the reworked NFE class in directory c:\_FlowControl passing 1, then run again passing one. The above screenshot shows the output of running our reworked NFE class when we pass 1 andone. We got a NumberFormatException when we passed one. As you can see the finally block always runs whether an exception occurs or not. Save, compile and run the DivideByZero2 class in directory c:\_FlowControl in the usual way. The above screenshot shows the output of running our DivideByZero2 class. We got a We got an ArithmeticException exception when we tried to divide by zero as expected. The finally block always runs and in our example we print some messages before the runtime exception crashes the application. Save and compile and the reworked NFE class in directory c:\_FlowControl. The above screenshot shows the output of compiling our reworked NFE class, we got a compiler error. The reason for the error is that we have the catch all Exception class in our first catch block, which will catch every exception. This means the other two exceptions can never be reached. When we code multiple catch blocks, we have to work up the inheritance tree from the most specific exception to the most generic. So in our code and using the exception hierarchy diagram above we can see that the catch blocks should be ordered NumberFormatException or ArrayIndexOutOfBoundsException which are the lowest in the inheritance tree. The order of these two doesn't matter as they are at the same level of the inheritance hierarchy. The catch all Exception comes after these two. In the code below we have put the catch blocks in the correct order. Save, compile and rerun the reworked NFE class in directory c:\_FlowControl with no arguments, then run again passing 1, then run again passing one. The above screenshot shows the output of running our reworked NFE class with no passed arguments, when we pass 1 and one. We got an ArrayIndexOutOfBoundsException when we didn't pass any arguments and output an error in the catch block for that exception. When we passed a 1 the code runs fine. When we pass one we got a NumberFormatException and output an error in the catch block for that exception. As you can see the finally block always runs whether an exception occurs or not. In this lesson we looked at handling exceptions which may occur within our code. In the next lesson we learn how to use the throw keyword which allows to throw exceptions from within our methods. We also investigate how to declare exceptions using the throws keyword.